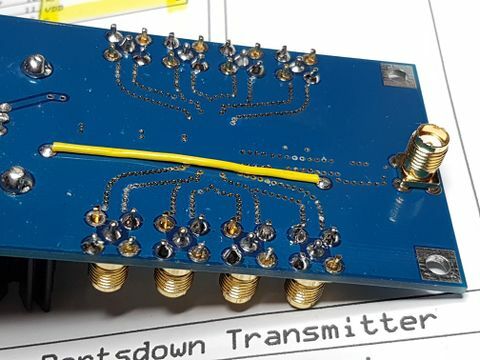 For those of you who want to drive Microwave transverters from your Portsdown or need a higher drive level, the team have developed an 8-Band RF output switch that includes an RF amplifier. 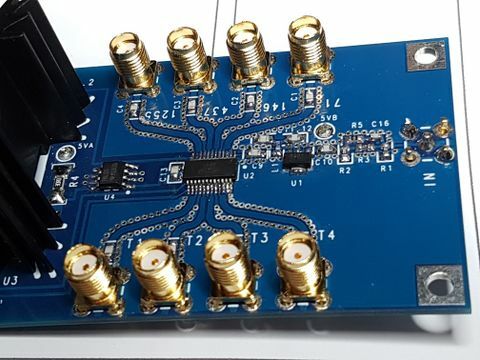 It is capable of amplifying the variable level from the Filter Modulator board / Lime SDR up to 10 dBm and switching it to separate external amplifiers for the 70, 144, 437, 1255 bands and up to 4 transverters for the higher bands. One of the 4 transverter output can also be used for 2300 / 2400 MHz - see mods below to maintain output level. The module should be used with the 8 band decoder which will provide PTT steering for the 8 bands - see this page for more details. PCBs and the control PIC are available from the BATC Shop. The Current PCBs from the BATC Shop are Version 2.2. The previous version, V2.1 requires 2 minor corrections during construction. The current batch of PCBs from the BATC Shop are version 2.2, which have this fault corrected. 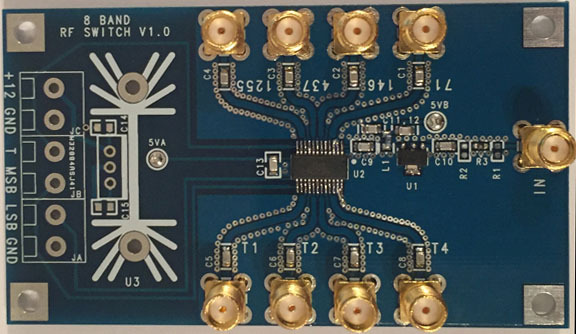 The circuit for Version 2.1 and 2.2 PCBs is here: Media:8 BAND RF SWITCH V2-1 SCH.pdf. The latest parts list is here File:8_BAND_RF_SWITCH_V2.2a_PARTS.xls. This list is corrected to increase the value of C13 to 2.2 uf to prevent the 5v regulator oscillating. 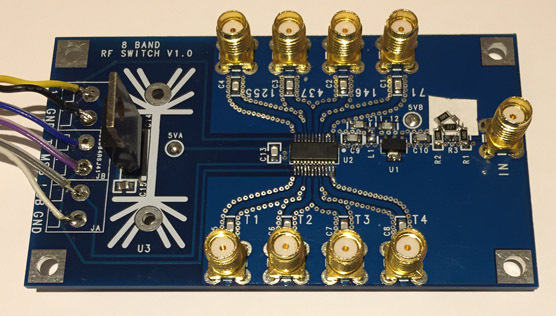 When used with the Lime SDR, Dave G8GKQ recommended changes to the input attenutor in his article in CQ-TV 262 to improve performance at 2.4GHz. C16 changes to 1pF and R5 becomes a Zero Ohms link. The modification is shown here on a prototype PCB with the 1pf capacitor on the white square. All the parts in the attenuator are 0603 sized; the V2.3 arrangement is in the revised parts list. The initial design was as shown above - the first batch of boards will be supplied in this form. The initial (V1.0) circuit is here: Media:8 BAND RF SWITCH V1-0 SCH.pdf. Cut the track on the underside between the output of the voltage regulator and the link point marked 5VA. Replace the 7805 with a 7808 regulator (for 8 volts) and wire a 30 ohm resistor between the regulator output and the the point marked 5VB. Note that the resistor will need to dissipate 300mW (it passes 100mA), so 3 1/8 watt 10 ohm resistors in series might be easiest. Wire a new 78L05 regulator on the underside of the board with its input from the 12V supply and its output to the point marked 5VA. The input attenuator should be set up with R1=R2=68 ohms, and R3=220 ohms. To get the full 10 dBm output on 1255 MHz, add a series combination of 68 ohms and 2.7 pf across R3. The first batch of PCBs do not have pads for the extra capacitor and resistor. The modified board is shown below. The 8-way switch is intended to be used in association with the digital attenuator described here https://wiki.batc.org.uk/Output_Attenuator . Typical system output levels with the digital attenuator connected to the output of the filter modulator board, and followed by the 8-way switch are shown below. Output levels and shoulder levels with the attenuator set to 0 dB and 3 dB are included.